A few recent bad decisions by the Indian government might force Samsung to stop the local manufacturing of Galaxy Note 9 and Galaxy S9 flagships. Even worse, the company might drop its plans to increase the exports of mobile phones made in India, which were supposed to hit 40 percent of the production for 2019. Last year, the Indian government decided to impose a 5 percent duty on open cell LED panels. That decision made Samsung to stop manufacturing TVs in India in the last quarter. Now, the same government took another bad decision that might force the multinational tech giant headquartered in South Korea to severely decrease the manufacturing volume of its Indian production facilities. The Phased Manufacturing Programme (PMP) timetable for the local production of components such as touchscreen panels has been changed by the Indian government so the companies must start the process in February 2019 or pay an 11 percent import duty (with a surcharge as well, from a regular value of 10 percent). 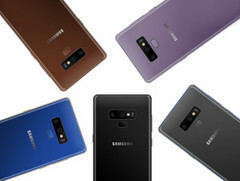 In most cases, the display panel of a smartphone accounts for 25 to 30 percent of the total production cost, so the changes mentioned above will push Samsung's costs up. The company says that local manufacturing of Galaxy Note 9 and Galaxy S9 flagships would have to stop if the government does not leave the PMP timetable untouched. Next to stopping the local manufacturing process of its flagship products, Samsung could also be forced to reconsider its plans to increase exports of handsets made in India from 15 percent to 40 percent of its local production volume. In a letter to the government, Samsung said that "India-made mobiles will not be able to compete with the costs of low-cost manufacturing economies like Vietnam." Right now, it seems like the Indian government is thinking about dropping the 5 percent duty on LED panels for TVs. Unfortunately, the changes in the PMP timetable are apparently not involved in the discussion yet.